Thanksgiving can sometimes feel like a forgotten holiday wedged in between Halloween and Christmas, but it's actually an all-American day designed to bring together friends, family and food in one great celebration. 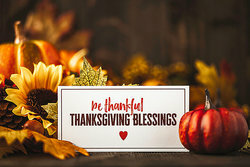 First celebrated by the pilgrims in Plymouth and later made into a national day of reflection by Abraham Lincoln during the Civil War, Thanksgiving is the perfect time to give thanks for what you have in your life. Not sure how to express yourself on this holiday? Try using some of these quotes and sayings to let your friends and family know how you feel about them. Whether you're looking for something religious, thoughtful or just plain fun, there's sure to be something here that encapsulates what you're feeling on the fourth Thursday of November. No matter how far you travel or how many people share your Thanksgiving meal, be sure to show your gratitude and share your thoughts with the people you care most about. Sometimes a simple quote is all it takes to get the conversation started - and then you'll be talking, laughing and sharing all the way through to dessert. "Thanksgiving Sayings." YourDictionary, n.d. Web. 20 April 2019. <https://quotes.yourdictionary.com/articles/thanksgiving-sayings.html>.